Body & Breath Inc. Hardcover. 0970700601 New Condition. . New. Motilal Banarsidass Publishers. PAPERBACK. 8120819764 New Condition. . New. 2004. Body and Breath. PAPERBACK. 097070061X New Condition. . New. Honesdale, Pennsylvania: Body & Breath, 2001. Near Fine in hardcover. 24 by 16 cm. 623 pages. Illustrated cover. Contains many black and white illustrations from photographs. Glossy pages throughout. Name of former owner on front free blank endpaper. Bright, clean.. Hard Cover. Body and Breath. PAPERBACK. 097070061X . New. Body and Breath. PAPERBACK. 097070061X Very Good Condition.Access codes and supplements are not guaranteed with used items. No highlighting and No markings.Covers could be repaired or might have self wear sign . Very Good. Himalayan Institute Press. PAPERBACK. New . New Book. Shipped via DHL/FEDEX with tracking ID. Motilal Banarsidass Publishers. PAPERBACK. 8120819764 Like New Condition. . Fine. 2004. Body & Breath Inc. Hardcover. 0970700601 Like New Condition. . Fine. Body and Breath. PAPERBACK. 097070061X Like New Condition. . Fine. Body and Breath. PAPERBACK. 097070061X Special order direct from the distributor . New. Body and Breath, 2010. First edition. Softcover. New. Anatomy of Hatha Yoga--revised and updated with full color illustrations and photos â is the most comprehensive and authoritative work available correlating the study of hatha yoga with anatomy and physiology. It is a must-have for anyone who is serious about studying or teaching yoga, and an invaluable resource for anyone in a field relating to physical conditioning. The author holds a PhD in Anatomy and was a sought-after professor, teacher and yoga practitioner for over thirty years. He lived and taught at the Himalayan Institute for Yoga Science and Philosophy, and the University of Minnesota and Columbia University medical schools. The book is unique in the literature, combining the breadth and depth of a textbook with the readability, humor and flow of the great science writers of our time, while bridging the gap between biomedicine and complementary medicine. In it, you will find a comprehensive overview of yoga anatomy and physiology, with special emphasis on the musculoskeletal, nervous, and cadiovascular systems. The book presents the anatomy of yoga in scientific terms, while at the same time respecting its principles. The author discusses the basic premises of hatha yoga with foundational material accepted in biomedical sciences, expressly avoiding comment on non-physical concepts such as prana and the chakras. Postures are discussed in detail and depicted in excellent quality color photographs, accompanied by anatomical diagrams to illustrate critical processes and muscle groups. Printed Pages: 622. Honesdale: Body and Breath, 2001. Paperback Octavo. Paperback. Very good. wraps, 622 pp. Body & Breath, Incorporated . softcover. New. Body & Breath, Honesdale USA 2001.. 8vo. laminated boards, hardcover. Very good. .
Motilal Banarsidass Publishers Pvt Ltd, 2010. 5th or later edition. Softcover. New. 15 x 23 cm. Anatomy of Hatha Yoga is the first modern authoritative source that integrates the study of hatha yoga with anatomy and physiology. Yoga, teachers, committed practitioners, medical professionals, or anyone who is curious about how the body responds to yoga will find this book an unsurpassed wealth of knowledge. It was written to meet the needs of a general audience while seeking to attract and challenge the interests of medical professionals. In this ground-breaking work, Dr. H. David Coulter shares the fruits of decades of academic research and personal experience gained through practice and study with Sri Swami Rama and other faculty of the Himalayan Institute. Dr. Coulter offers an objective analysis of the deeper aspects of Hatha yoga, discussing its effect on the major systems of the body. Providing a comprehensive overview of the anatomy and physiology of hatha yoga with special emphasis on the musculoskeletal, nervous, and cardio-vascular systems, this book bridges biomedicine and complementary medicine. Featuring over 230 photographs and 120 diagrams and anatomical illustrations, hundreds of yoga asanas are covered in detail. This classic work is an invaluable resource for any serious yoga practitioner or medical professional. Printed Pages: 623. Body and Breath, 2010-01-01. Paperback. Used:Good. Himalayan Institute India. New. Very good condition. Honesdale, Pennsylvania, U.S.A.: Body & Breath Inc, 2001. A few small dents/bends on cover. A few very small stains to bottom edge of closed pgs.Touch (only) of mositure crinkling to bottoms of a few pgs. Spine is tight; pgs appear unmarked. SIGNED BY AUTHOR on endpaper. 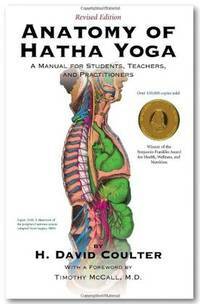 Winner of the 2002 Benjamin Franklin Award in the category of Health, Wellness, and Nutrition, this authoritative book correlates the practice and discipline of yoga with modern anatomy and physiology. 230 photographs. 120+ diagrams & anatomical illustrations.. Signed By Author. Hardcover. Good+/No Jacket as Issued. Body and Breath. PAPERBACK. 097070061X Remainder mark . Fine. Body and Breath. PAPERBACK. 097070061X BRAND NEW, GIFT QUALITY! NOT OVERSTOCKS OR MARKED UP REMAINDERS! DIRECT FROM THE PUBLISHER!|2.14 . New. Body and Breath. Paperback. 097070061X . Fair. 2009. Body & Breath Inc. Hardcover. 0970700601 . Very Good. 2001. Body and Breath. Paperback. 097070061X . Very Good. 2009. Body & Breath Inc. Hardcover. 0970700601 . Fair. 2001. Honesdale, PA: Body and Breath, 2001. (2001), 623pp, illus., very light shelfwear to cover, contents clean.. Hard Cover. Fine/No Jacket. Body and Breath, 2010-01-01. Paperback. Good.